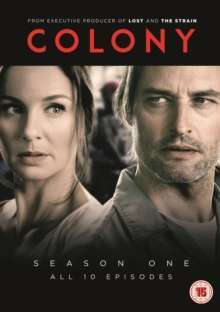 Der Artikel Colony Season 1 (UK Import) wurde in den Warenkorb gelegt. All ten episodes from the first season of the American sci-fi drama which follows a family trying to survive in a dystopian near-future Los Angeles. After a mysterious alien race conquers the city, Will Bowman (Josh Holloway) tries to keep one step ahead of the militarised occupying forces while also trying to locate his 12-year-old son who is missing. When he is propositioned by collaborators within the new order, Will and his wife Katie (Sarah Wayne Callies) are forced to make some big decisions which could place them and their children in grave danger.